Good news to all Khon Philippine who have cars and motorcycles driving in Bangkok who wish to see the north and northeast. 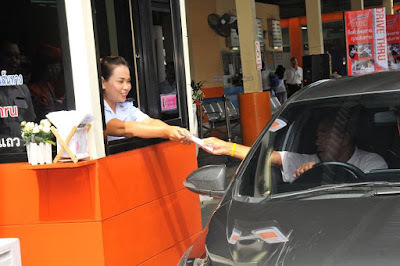 Apart from personally appearing at a bus terminal window for ticket purchases which can be a bummer sometimes due to traffic and the difficulty in finding a place to park sometimes, there is another alternative in buying a ticket without getting out of your car. The government-run Transport Company just opened its brand-new “Drive Thru” lane at Rangsit Bus Terminal. According to a Bangkok Post report, Pol. Gen. Amnat Unardngam is the one responsible for overseeing this pilot project which was launched on Friday last week.